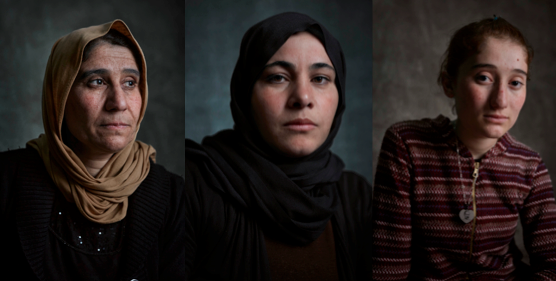 Marking International Women’s Day, #IamYezidi, is a compelling, photographic exhibition that explores the hardships faced by Yezidi women in Iraq, running from 21st – 26th March at Lacey Contemporary Gallery, 8 Clarendon Cross, London W11 4AP. The exhibition captures the heartbreaking but inspiring stories of just some these brave women, highlighting their suffering while paying tribute to their incredible strength. #IamYezidi explores the individual stories of women who have escaped slavery or rescued their sons and daughters from ISIS captivity. The stories of their pain, sorrow and continued hardship but also their resilience, commitment to righteousness, honour and their will to survive, are captured through vivid, portrait photography by award-winning photo journalist, Benjamin Eagle, and international, humanitarian charity, Khalsa Aid. Khalsa Aid, alongside the Jinda Centre, Northern Iraq, has been supporting over 500 Yezidi women since January 2016 and this number continues to rise as more women are rescued from ISIS captivity. The charity has been providing food and clothing supplies and general welfare including psychological support and rehabilitation to those returning from ISIS captivity, having survived extreme abuse and torture. Khalsa Aid’s support also includes the acknowledgment of the suffering of these remarkable women and listening to their stories – conveyed through the exhibition to highlight their experiences. Almost all of the women who have been rescued or have escaped from ISIS want to tell the world about their experiences whilst in captivity. A forgotten community, these are women who look forward to the Khalsa Aid visits each month, for the human interaction above anything else, having lost all male members of their families, killed by ISIS. The Yezidis comprise a minority community in the Middle East, who have been attacked by terrorist forces such as ISIS in the most inhumane, horrific and debasing manners imaginable. Originating from one of the oldest faiths, they are stigmatised by other communities, seen as the pagans of the Middle East, ‘devil worshippers’ persecuted for their spiritual views. Each month, an increasing number of girls are returned and rescued from ISIS imprisonment. During Khalsa Aid’s last trip, 29 young women had reached the Jinda Centre, the youngest aged 16. There are still over 1,000 girls held captive by ISIS and treated as commodities. Families are forced to ‘buy’ their wives, mothers and sisters back, with money saved through bartering their monthly food rations. Having survived the most unspeakable cruelty, these incredible women are positive about what the future holds, slowly rebuilding their lives and networks day by day.